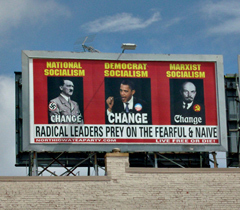 Mason City may be facing a sort of boycott because of a billboard that depicted President Obama alongside Adolf Hitler and Vladimir Lenin. The city’s Chamber of Commerce has gotten e-mail, Facebook comments and about 50 phone calls dealing with the billboard, which was paid for by the North Iowa Tea Party. Chamber executive director Robin Anderson says the people who’ve taken the time to call or write say they were planning to visit or do business in Mason City. She says the chamber staff is doing its best to handle the comments, but it’s very disheartening. Anderson says they’ve responded to the e-mails by saying the North Iowa Tea Party has every right to express its opinion, but those views are not representative of the values of north-central Iowans. She says many of the callers have been very courteous, but firm. News about the billboard first broke on Tuesday and the billboard was covered over on Wednesday morning. Anderson is worried people doing a web search for general information about Mason City will read about this story. “As of (Wednesday afternoon) at two o’clock on Google News, there was 1629 news stories by different news organizations all over the world, so search engines for who knows how long on the Internet when you ‘Google’ Mason City or search for Mason City are likely to pop up with this billboard,” she says.